ISS036-E-024930 (25 July 2013) — The unpiloted Russian ISS Progress 50 (50P) resupply ship seen shortly after undocking. 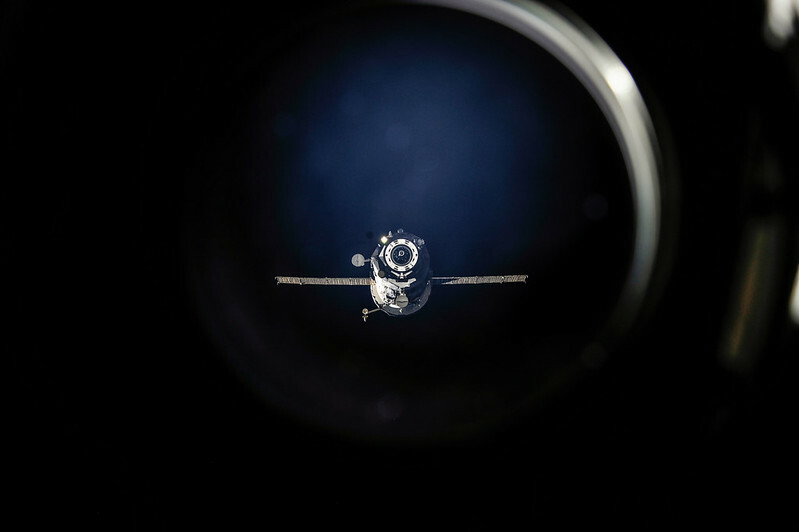 Progress is an unmanned cargo craft used to resupply the International Space Station. Attempts by Russian ground controllers to regain control of the Progress have been unsuccessful, and they have said they will not be able to regain propulsive control of it. As a result, the Progress currently is expected to reenter Earth’s atmosphere within the next two weeks. Russian ballistics specialists, working in conjunction with flight controllers in Mission Control Houston and ESA, are continuing to track the vehicle’s path and will provide updates on its anticipated reentry date. The United States Air Force Joint Functional Component Command for Space’s Joint Space Operations Center is also tracking Progress, performing conjunction analysis, and providing warning of any potential collisions in space to ensure spaceflight safety. The break up and reentry of the Progress poses no threat to the ISS crew. Without command control, will there be any way to direct the cargo ship to enter the atmosphere and hopefully break up over an ocean so that any pieces that don’t burn up will fall there instead of on towns, cities and people? No, there isn’t. It is going to come down where it comes down. What vehicle mass is being assumed in NASA’s calculation of date of demise of the errant Progrress? Not likely. However, 71% of the earth is covered by the ocean, and quite a bit of the rest is just uninhabited. It’s very unlikely it’ll come down over a populated area. No they won’t be able to control the trajectory of this craft any more. I believe it is completely out of control – it looks like a 3rd stage propulsion failure or separation failure. But the chances of any impact on humans is very low. In fact early stage rocket failures are more likely to harm people depending on prevailing winds because of the toxic nature of many propellants. No need to worry about in this instance – any debris (if there are any as the craft has no heat shield) will be small and most likely to land in the water or a desert somewhere. The Russians generally do a very good job in space – as well as the US, even if they use quite different equipment to do it. They need to check this out carefully, though as this sort of craft would not be expected to fail as it is so similar to the equipment used for manned missions. My guess is an assembly error or the introduction of a modified part that has had insufficient testing. No, but if you think about it, the chances are pretty slim. Most of the Earth I’d water, and human population centers don’t really take up that much acreage. Russia should take the responsibility of such high-tech cargo crafts. We understand they took enough care but the reality represents a different picture. Where is there backup plans ? If they think they are not eligible to care space I guess it’s time for them to go for vacation! Small news to you: space travel is difficult. Rockets fail! How many US shuttles with people on board exploded??? Dont understand what the point ur comment is. Accidents will happen to even the best space programs. The Progress (and related Soyuz) have an excellent reliability record. If it DOES come down in a populated area and cause a problem I’d expect them to take about as much responsibility for it as they did with MH17/MAS17. U.S. Has also many failed attempts. There are multiple back up systems which all have had catastrophic failures. These things do happen and most man’s successes are based on past failures. Is it time NASA had available to the ISS crew, a small excursion vehicle capable of rescuing rogue resupply capsules? Such a vehicle could be scrambled to detach from the ISS and manoeuvre itself in position to attach to the stray capsule and either to facilitate an onboard investigation or take over the provision of thrust and control to “tow” the capsule to the ISS and save the valuable contents? Surely this is possible and would pay for itself after just two or three similar excursions? The vehicle wouldn’t be a re-entry vehicle, but effectively the first extra-curricular permanent space-exploration platform. The progress vehichle was a long ways from the station..it didn’t even reach its intended orbit. How on earth would your magic craft fly out so far and catch it???? This would be exceedingly difficult, if not impossible. First, the ISS is in a completely different orbit than the Progress. It would take a lot of fuel to get there and back. Secondly, the Progress appears to be completely out of control, with a very high roll rate. There would be no way to safely dock with the spacecraft and get it under control. Why put astronauts’ lives at risk for a few non-critical supplies? Nice idea, recovering a rogue supply ship, but having a miniature vehicle, whether manned or robotic, to go retrieve one depends on where it is relative to the ISS, their relative orbits, and of course their relative velocities, not to mention the retrieval vehicle capability to reach and match orbit with the rogue, and its ability to return. None of that is simple either to plan or execute, and space is big. first thing that came to mind, kinda an ISS tow truck just for things like this…. It’s really really hard to rendezvous with another object in space. It would be very hard to do it in a fast enough time to help. It’d also take quite a bit of fuel. And with all of that being the case, these incidents are very rare. So it may be possible, but it likely wouldn’t be worth it. Although it is theoretically possible, it is much …much MUCH harder than it sounds. there are many factors to consider, first the “collector” would have to match the orbit of the object to collect. this by itself takes a long time and ammount of fuel, then the collector would need the appropiate “clamps” to hold on to whatever is collecting. Also, an out of control satellite will most likely be rotating on itself, most likely on more than one axis. try to grab it and at the very least you will end up rotating without control too. Finally if you DO manage to do all of the above, you still need to perfectly align the center of gravity of both sattelites to the thrusters in order to, Again, use a considerably ammount of fuel to match the orbit of the ISS. can nasa creat and attech megetic cover device to search like this type of satelite problems ????? is it possible? ???? Leaving aside any concern for the ISS (and leaving Gravity out of the discussion, please), as the Progress is designed for re-entry and full shielded, is there any realistic concern that Progress might survive re-entry intact? Speaking of Gravity… any chance an out-of-control Progress 59 could hit other objects in orbit ? The Progress is not designed for reentry and has no heat shield. It is supposed to burn up in the atmosphere at the end of its mission. The related manned Soyuz is designed for reentry. If it tumbles during re-entry it will most certainly disintegrate. Hi Chris. No worries. Progress is not designed for re-entry and always burns completely in the atmosphere. Plus, safe re-entry requires very precise positioning of a space craft. Currently the only cargo ship able to come back to the earth surface is Dragon. Progress does *not* have shielding to survive re-entry – on the contrary, it is designed to burn up in the atmosphere at the end of its mission. Yes, it is possible that some pieces may survive and reach the ground, which is why they normally use a controlled re-entry into a remote area of the Pacific Ocean. It’s too early to determine exactly when and where any debris might fall; it could take anywhere from a few days to a couple of weeks for its orbit to decay enough to start re-entry. Progress is not designed for re-entry. Every Progress ends its mission with destructive re-entry and is used to dispose of items that are used or no longer needed by ISS as a disposal method. The Soyuz which carries people and some small amount of supplies (going up) and return items (coming down) *is* designed for re-entry. They are not the same craft. Progress spacecraft are not designed to survive reentry. It has no chance of landing intact, although some pieces of it might survive. SpaceX’s Dragon is currently the only operational cargo craft designed to survive reentry and be recovered. Progress is NOT designed for reentry. It does NOT have a heatshield to protect it during reentry. It burns up during reentry. That’s how the ISS garbage is disposed of. Actually, Tom, Progress is designed specifically to burn up on re-entry. Expended Progress ships are the ISS’ garbage disposal system! 1. Progress always ends its mission by destructive reentry. It is not designed to “survive re-entry intact”. Unfortunately, without propulsion, there is no way to control where this Progress will reenter, so any pieces which survive will hit at some currently unknown location. 2. The “backup plan” has always included all of the other resupply craft which regularly visit the station. Even discounting ESA’s ATV, since it is no longer flying, there are still: Japan’s HTV, Orbital ATK’s Cygnus, and SpaceX’s Dragon. 3. Calm down people. Failures happen. You pick yourself up, dust yourself off, and try again after you’ve fixed what went wrong. To add what John Cambell had stated a small vehicle should have already been a part of the iss, that would also give them another way to go out and inspect the station without putting on a suit. if it was not a reentry vehicle it could still be used in may ways, but if it was then there is another way for them to safely get back to earth safely. Any chance an out-of-control Progress 59 could hit other objects in orbit ? Space flight will always be a risky business, especially in it’s infancy as it still is. The cargo spacecraft wouldn’t be a threat to the station since it’s altitude, PEA, Apa aren’t high enough to reach it. Hopefully the spacecraft will break up over the ocean. Extremely concerned about the increased of junk in space and the dangers to earth and the non existent? Back up plans by the Russians.showing total disregard for the consequences of their failures.The space doesn’t belong to anyone and should be respected. We all will suffer for the ambition selfishness of a few. Time to take consciousness for their actions as they are damaging the environment and the human race. the Universe it interesse me a lot !!! WHICH THE BEGINNING OF EVERYTHINGS WHERE THE STARS AND THE PL;ANET BORN !!! @Chris, I think the shield will only work if the trajectory of descent and pitch of the spacecraft are the correct ones. Surely the spacecraft is not fully shielded 360º. Still your question is quite meaningful and in my perspective there is a real danger that a big enough chunk may survive reentry and hit a populated area. Having seen so many posts about this so far where in none of them this subject is even mentioned is enough to worry me. I would really like to hear contingency plans for critical resupply and possible inconvenience for the ISS astronauts / cosmonauts. Shoot a missile at it and have it strike from the dark side (side opposite of Earth’s ). Both break up of material, and faster re-entry velocity making it safer due to burn up. Necessary? No. Good training for armed forces? Yep. Anyways shoot it. Make it fun at least. I would assume the Progress is designed to separate prior to re-entry the same as the Soyuz. Hitting atmosphere in one piece instead of three would drastically alter the re-entry profile. No, Progress may look like a manned Soyuz but it’s not built exactly the same. All of the modules of a Progress vehicle stay together during re-entry so it can be de-orbited in a controlled manner and any remaining debris that makes it through the atmosphere will land in the same area. Progress does not separate prior to re-entry…as I said in another post (which was directed at Chris, not you..my bad, guys! ), Progress is designed with no heat shielding at all and is intended for destructive re-entry so as to serve as a garbage disposal system. A queda poderá causar uma possível extinção ou danos graves a população mundial? uma grande perda eu lamento. It’s a little late to think about how to retrieve an errant capsule. The ability to retrieve it is already on board, but safety constraints prevent them from making use of the equipment. By the way this would be a good job for R-2 when it gets it’s space capable upper body. Tethers and nitrogen powered safety mobility assists would be enough for it. This is a great opportunity for NASA to practice for “Asteroid Redirect Mission”. It can be captured and put on Moon’s orbit. Practice makes perfect not to mention having an extra pair of pants will go a long way when someone visits the moon next time. Jokes aside, I hope it doesn’t hurt anyone and burns up over an unpopulated area. It is really unfortunate that Russians aren’t able to regain control of this cargo, since it would be a lot of waste in terms of money and time. I hope that in the future more tests will be done in order to avoid this kind of situations. I completely agree with NASA and US ‘safety first’ approach. I also hope that when unmanned cargo reenters Earth’s atmosphere someone will be ready to blow it up with rockets if it poses threats to anyone. Space is big. Even the small space around out planet is big. Expecting a small robot or ship (which we don’t have) to be available without notice to dash off and rescue an out of control spacecraft on an unexpected flight path with the potential of requiring huge amounts of fuel and time to just get there, let alone sync with its tumbling, stabilize it and drag it somewhere useful (wherever that is- using another large expenditure of fuel) is asking that we live in a Star Wars age now. Not likely to happen any time soon. The Progress is designed to burn up. I just hope it turns out to be somewhere safe. This is another reminder space travel isn’t as easy as sci-fi movies make it look. Couldn`t somebody use it for target practice & break it up before re-entry? Don`t know if that is possible just wondering. Progress 59 would be unrecoverable. From the reports of non-deployment of the antennas for ground communication I would guess that the shroud that covers the capsule during the boost phase only partially separated or, during separation, destroyed the antennas. The spacecraft is reported to be in a 2-3 RPM spin, not a roll. Stopping this would be beyond the capabilities of any thrusters currently available to the crew of ISS, including R-2. Safety wise, it’s WAY too much of an unacceptable risk. It never made the ISS’ orbit, anyway, which puts it out of reach of the crew, any way. Con lo sucedido y en vista de la enorme importancia que requiere dia a dia la exploración del universo, es hora de iniciar el diseño de un remolque tipo universal, para recuperación de naves espaciales que presenten fallas de control en sus misiones. @Carol Manka: Without any kind of propulsive control, no. The best that can be done is to track the vehicle and provide warnings to those along the projected reentry path. But considering that the earth’s surface is 3/4 water, most likely that’s where it will end up. Even if it does come in over land, most likely it will not be a serious threat. The majority of the earth’s land area has a population density of less than 25/km², with the main exceptions being eastern China, Japan, India, northwestern Europe, the eastern US, central Mexico, and Africa’s Gold Coast. The rest of the world is just too sparsely populated for it to be of great concern. Consider the breakup of Columbia in 2002. No injuries on the ground were reported, and even property damage was pretty minimal. And that was over one of the aforementioned densely populated regions. @John Campbell: I think your “orbital tug boat” would be somewhat impractical, at least if it depends on traditional combustive propulsion, as the fuel requirements would be prohibitive. It would only be useful for a very small percentage of possible failure modes; namely those in which the crippled craft is already in a rendezvous orbit with the ISS. Down the road, I could possibly see a version using ion propulsion becoming practical, but in this case I still don’t think it would help, for a few reasons. First, Progress vehicles are launched into a “parking orbit” that naturally decays in only a few weeks. At this point, it is simply too far away from the ISS for an ion-drive-equipped recovery vehicle to reach it in time. Secondly, the spacecraft is tumbling at a rate of something like 20 revolutions per minute. This would make rendezvous and capture extremely hazardous, and would require completely new methods that would probably take years (if not decades) to develop. @Chris: As passengers on Soyuz 5 and Soyuz TMA-11 can attest, reentering without service module separation is bad. In this configuration, the most stable orientation tends to be nose-first, with the heat shield pointing uselessly to the rear. Fortunately, in the two aforementioned manned cases, the SM separated before maximum heating and the spacecraft reoriented itself aerodynamically, but these were very close calls that could have ended up just like Columbia, and in both cases they made hard landings far off course that resulted in injuries to astronauts. Good telemetry down link until separation. Besides a bad computer, possible collision with the third stage booster or an Apollo 13 situation (Yes, I remember) with the service module? All could produce the end over end spin. Doesn’t the possible presence of up to 1400 kg of toxic propellants create a higher hazard level than just falling hardware? How much propellant does NASA believe remains on board, based on what evidence? Can we all be that crazy to think this is alright to happen? Has anybody been asked about the possibility of dying in such a way? How can some people determine about others`life? When will the next Progress 59 status update be posted ? Se por acaso a Progress passar pela atmosfera intacta, ela será interceptada no ar?